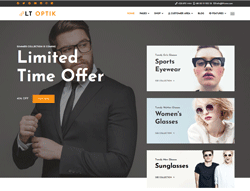 LT Optik is Responsive Virtuemart Joomla template tailored for eyeglasses, sunglasses, eyewear, contact lenses and other eye extensions online. This is the multipurpose solution for selling eyewear product through online store and shop. The look of this theme is aesthetic, minimal clean, bright, simple and excellent, it is ready for selling eyeglass and spectacle frames but changing images you can tailor it into your desired niches without touching a single line of code. Any eyeglasses store must be able to present its products in an elegant and impressive way. This is why our layouts base their charm and power on high quality product images and smooth visual effects that improve the product presentation and the user experience. To create the stylish design, the content is structured like a grid and uses big white spaces to build the impression of cleanliness and organization. LT Optik is integrated with VirtueMart and may display products using 8 available views. It is 100% responsive, clean and stylish. The template comes with 4 colors schemes, but in fact it is really customizable, has drag and drop tools and color settings helping to create unique websites with various layouts. Template framework support page builder, mega menu, unlimited position layout and multi-language.